Sterling silver stackable name ring personalized with name, milestone date- perfect keepsake graduation ring, anniversary band, mom or dad ring for one child to cherish a lifetime. Sterling silver hand stamped ring measures 4mm. Personalize with up to 12 characters. Unisex band available in sizes: 5, 6, 7, 8, 9, 10, 11, 12. Categories: Dads & Grandpas, Expecting & Push Present Gifts, Graduation & Teacher Jewelry, Hand Stamped Rings, Men's Gifts, Rings, Rings for Men, Stackable Rings. Tags: name ring, personalized ring, stackable ring, sterling silver. Mom or Dad Ring: personalize with child’s name and birthdate. 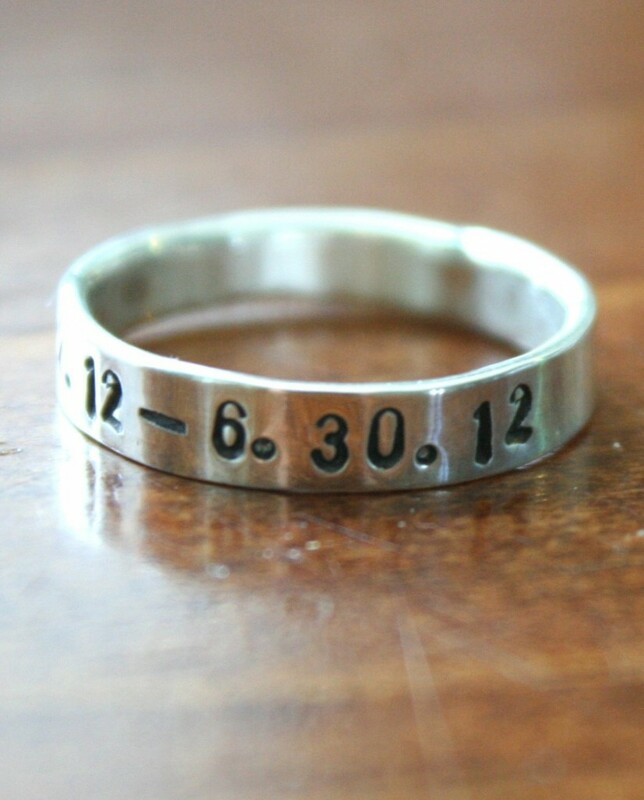 Wedding or Anniversary Ring: personalize with bride and groom’s name and wedding date. Graduation Ring: personalize with graduate’s name and class year. Many of our products are custom designed at the time an order is placed, so we ask that you please make your selection very carefully. Jewelry that has personalized stamping is not returnable. If there is a problem with your order, please contact us within five business days of receiving your order atkandsimpressions@gmail.com or 913-583-0118. If there is an error and it is our mistake, once the jewelry is returned and the mistake is verified, we are happy to send out a corrected item and will reimburse any shipping fees. If the error is not our mistake and you are simply dissatisfied with the product, then the piece is yours to keep. We reserve the right to judge our own quality and we strive to send out the highest quality of hand stamped jewelry. Please note that we can not accept returns without prior approval. For approval, please contact us at kandsimpressions@gmail.com and be sure to note your order ID in the email subject line. We always recommend returning your purchase using an insured service. Please remember to ensure that the item you are returning are repackaged with all elements.